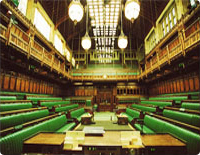 Parliamentary questions have a significant role in the House of Commons. They allow Members of Parliament to hold the Government to account, using either oral questions to Ministers in the Chamber of the House of Commons orÂ writtenÂ questions. Parliamentary questions are tools that can be used by Members of Parliament to seek information or to press for action. They oblige Ministers to explain and defend the work, policy decisions and actions of their Departments. All questions tabled are published provisionally in the blue pages of the Order Paper (the â€˜blues') and thereafter appear in the Question Book (the â€˜whites') and on the Parliamentary Information Management System (PIMS). All answers (and the original questions), whether transcribed from the Chamber or recorded from a printed format, are set out in The Official Report (Hansard) and PIMS so they are easily accessible.